Elected officials and real estate professionals debate solutions and strategies to City’s affordable housing shortage. 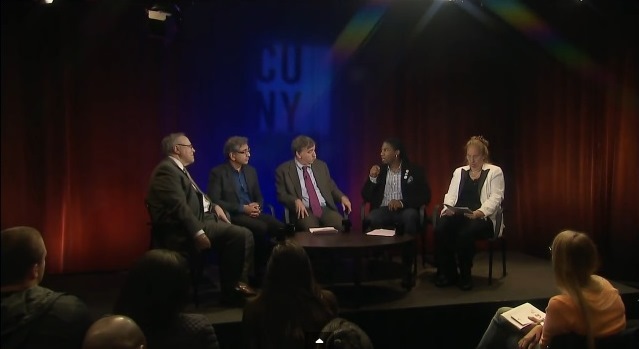 On October 1st, 2014 the City University of New York’s CUNY Forum series held a panel discussion titled “Affordable Housing and Social Justice in NYC”. The panel featured Manhattan Borough President Gale Brewer, Vishaan Chakrabarti of SHoP Architects and Associate Professor at Columbia University, Real Estate Board of New York President Steven Spinola, and Council Member Jumaane D. Williams. The debate was moderated by CUNY Forum’s host Bob Liff. The panel discussed a number of topics, including the “poor door” separate entrance for residents of affordable units in a planned Upper West Side building. Borough President Brewer called the door “frustrating”, stating the City Council had worked hard to ensure the building was fully integrated and no apartment was better or worse than another, but an overlooked provision in the inclusionary zoning law permitted the separate entrance. Mr. Chakrabarti spoke strongly against the door, calling it a “social abomination” and pointed to several affordable housing projects his firm is developing with no poor door. “One of the great things about our city is that executives and custodians take the same subway to work every day.”, said Mr. Chakrabarti. Mr. Spinola argued the poor door happened because of changes to the 421-A tax abatement program in 2007, eliminating tax break certificates for builders of luxury housing that build affordable housing off-site. “The decision was made by the previous administration that they wanted to get rid of the certificate program, but at the same time they would still like to take advantage of the luxury condo market and let them subsidize low-income housing.” Mr. Spinola went on to argue for the current system because low-income and luxury housing are now integrated in the same block. The largest point of contention among the panel was rent regulation. Mr. Spinola argued strongly against regulation, stating it was designed to solve a temporary shortage in housing after the Second World War, and has done nothing in the years since to ease the housing shortage in the city. “We can pretend that rent regulation is going to solve the housing shortage, it is not. We need to figure out other solutions.” Mr. Spinola stated REBNY believes rent regulation has discouraged significant new housing from happening, and pointed to an uptick in construction in Boston following their repeal of rent regulation. Mr. Spinola also stated there are currently 40,000 rent-regulated apartments in New York City occupied by tenants earning $150,000 or greater. Mr. Chakrabarti sided with Mr. Spinola, mentioning economic studies showing that imposing rent controls only increase housing costs across a city.